We have documented our evaluation of a patient's cognitive recovery following BS-EEG after his attempted suicide via lethal suspension. The patient was discovered by his family in a potentially lethal suspension by ligature. The duration of hanging was approximated at 15 minutes. In the emergency unit, the patient was admitted with a glasgow coma scale (GCS) score of 3, his brainstem reflexes were absent, and he exhibited contracted, non-reactive pupils. There was a hemorrhagic strangulation band around the patient's neck. Myoclonic jerks were observed while in the emergency unit. His arterial O 2 saturation was measured at 75%. Endotracheal intubation was performed and he was transferred to the intensive care unit. No sedatives or curare medications were used. The computed tomography (CT) showed diffuse cerebral edema. EEG electrodes were placed according to the International 10-20 system. The burst suppression pattern (BS) was observed during the first 3 hours of EEG [Figure 1]a. Intravenous valproic acid (2 × 400 mg per/day) was used and myoclonic jerks ceased within 2 days. The BS pattern was diagnosed as previously described: "High-voltage bursts of slow waves with sharp or spiked transients occuring against a depressed background". 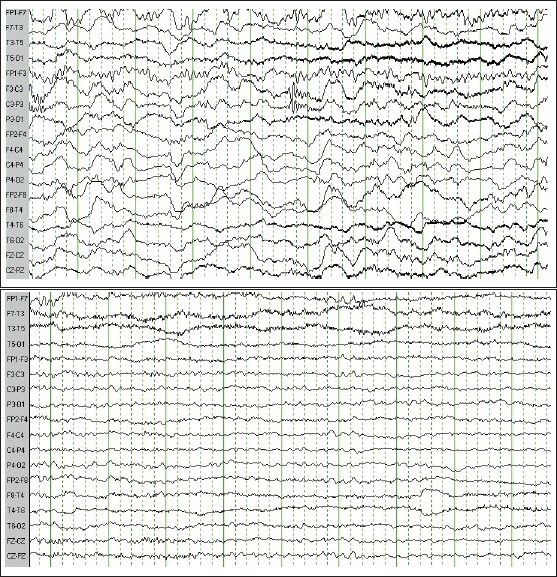 BS-EEG continued in the second EEG recording, in the first 24 hours [Figure 1]b. In the third EEG recording on day 6, generalized slow wave activities were discerned [Figure 2]a. The GCS score was 5 and brainstem reflexes were present. Temporal relationship between consciousness and EEG findings are demonstrated in [Table 1]. On day 10, the patient was responding to painful stimuli with flexor motor response in his extremities and he was extubated on day 13. In the last EEG recording [Figure 2]b, generalized low amplitude alpha and fast beta activities were revealed and the GCS score increased to 15. The repeated CT was recorded as normal. After 1 month, the patient was transferred to the rehabilitation unit. Neuropsychological evaluation was applied for the first month after hospitalization. 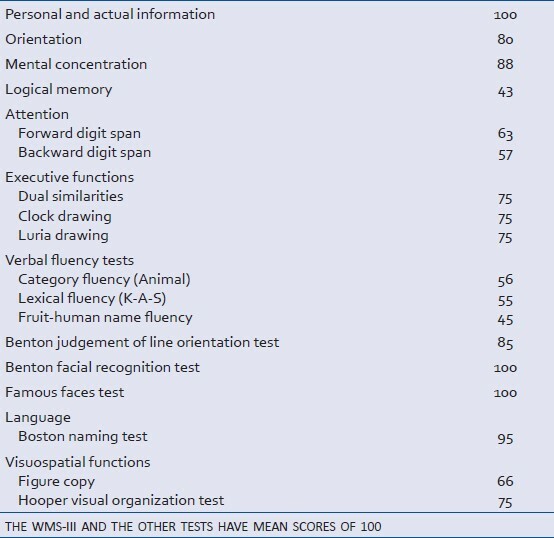 A total of 10 tests were selected to cover major cognitive domains: Wechsler Memory Scale-III [WMS-III,  the Verbal Fluency,  Dual Similarities,  Clock Drawing Test,  Luria Drawings,  Benton Face Recognition Test,  Famous Faces Test,  Benton Judgment of Line Orientation Test,  Hooper Visual Organization Test,  Boston Naming Test. Test scores are presented in [Table 2]. The outstanding findings were memory deficits, deterioration in the attention. Also, mild dysfunction was detected in some executive functions like working memory, planning, cognitive flexibility, and inhibitory control. Hanging is one of the most commonly used methods of suicide among both men and women. The impact of lethal suspension on cognitive functioning is dependent on the length of asphyxiation time. Enhancing initial diagnoses with EEG and cognitive tests can provide important information in determining the prognosis. Post-anoxic BS-EEG implies a poor prognosis as shown in previous related studies. Wijdicks et al. 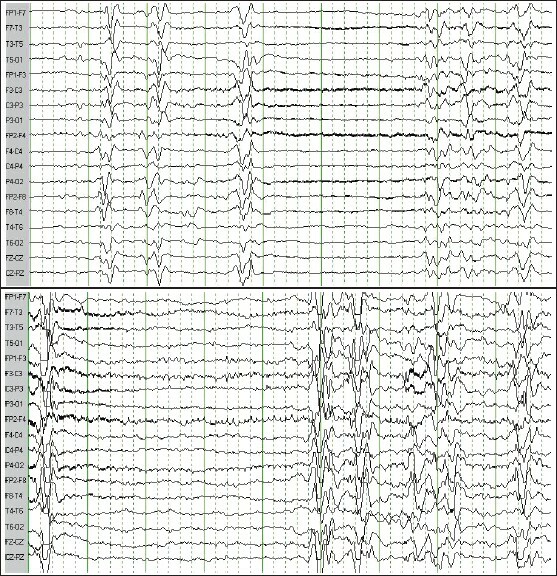 reported a repeat EEG in nine patients with BS-EEG on the day of resuscitation. Persisting BS-EEG was seen in six patients and transition to alpha coma pattern was seen in three patients. Thâmke et al. reported 24 consecutive patients who developed BS-EEG within 24 hours after cardiopulmonary resuscitation. In this progression, with only one exception, BS-EEG was followed by another EEG pattern within 1 day, mainly a reactive α EEG, isoelectric EEG, generalized continuous epileptiform discharges and θ EEG. In our patient, BS-EEG continued for 24 hours, followed by different wave patterns on the EEG, which were associated with generalized slow wave patterns and low amplitude alpha activity. Parallel to the clinical improvement, the EEG of our patient underwent a dramatic improvement and BS-EEG disappeared completely. Post-anoxic BS-EEG and subsequently evolving EEG patterns most probably reflect different forms of dysfunction of severely damaged cortical neurons. BS-EEG mostly indicate poor prognosis. However, our patient showed near-complete recovery. Earlier studies have demonstrated that patients with myoclonic jerks accompanying post-anoxic BS-EEG exhibit a poor prognosis and anticonvulsant drugs are usually ineffective. Our patient showed good prognosis in contrast to the expected trend. Myoclonic jerks stopped anticonvulsant treatment. Some anesthetic medications like propofol may cause a BS pattern in EEG. , Medication was not the cause of BS pattern in our case, as the EEG was performed prior to the use of any medication. The cognitive recovery patterns following anoxic injury have been documented by Caine and Watson. They revealed that amnesia is not detected in all cases of hypoxic-ischemic injury; it rarely exists as the only deficit. Zabel et al. said that amnesia could be due to hippocampal damage. Brain imaging methods as CT, magnetic resonance imaging (MRI), single photon emission tomography (SPECT) is useful in showing brain damage. In our patient, CT showed widespread brain edema. After a month, neuropsychological test battery identified mild memory deficits with an impairment of attention. BS pattern following lethal suspension has been reported for the first time. Our case is highly promising as it shows a good prognosis although burst-suppression pattern was perceived in EEG. 1. Zabel TA, Slomine B, Brady K, Christensen J. Neuropsychological profile following suicide attempt by hanging: Two adolescent case reports. Child Neuropsychol 2005;11:373-88. 2. Caine D, Watson JD. Neuropsychological and neuropathological sequelae of cerebral anoxia: A critical review. J Int Neuropsychol Soc 2000;6:86-99. 3. Thömke F, Brand A, Weilemann SL. The temporal dynamics of postanoxic burst-suppression EEG. J Clin Neurophysiol 2002;19:24-31. 4. Howard RS, Holmes PA, Koutroumanidis MA. Hypoxic-ischaemic brain injury. Pract Neurol 2011;11:4-18. 5. Noachtar S, Binnie C, Ebersole J, Mauguière F, Sakamoto A, Westmoreland B. A glossary of terms commonly used by clinical electroencephalographers and proposal for the report from the EEG findings. The International Federation of Clinical Neurophysiology. Electroencephalogr Clin Neurophysiol Suppl 1999;52:21-41. 6. Bauer G. Coma and brain death. In: Niedermeyer E, Lopes da Silva F, editors. Electroencephalography: Basic principles, clinical applications, and related fields. Baltimore: Williams and Wilkins; 1999. p. 459-75. 7. Wechsler D. WMS-R Manual: Wechsler Memory Scale Revised. New York: Harcourt Brace Jovanovich, Inc. (The Psychological Corporation); 1987. 8. Wechsler D. WAIS-R Manual: Wechsler Adult Intelligence Scale-Revised. New York: Harcourt Brace Jovanovich, Inc. (The Psychological Corporation); 1981. 9. Luria AR. Higher Cortical Functions in Man. New York: Basic Books; 1980. 10. Benton AL, Hamsher KD, Varney NR, Spreen O. Judgment of line orientation: Contributions to neuropsychological assessment. Oxford: Oxford University Press; 1983. 11. Rizzo S, Venneri A, Papagno C. Famous face recognition and naming test: A normative study. Neurol Sci 2002;23:153-9. 12. Benton AL, Sivan AB, deS. Hamsher K, Varney NR, Spreen O. Facial recognition. Contribution to neuropsychological assessment. Oxford: Oxford University press, Inc; 1978. 13. Hooper HE. Hooper Visual Organization Test (VOT): Administration manual (1983 ed. ).Los Angeles, CA: Western Psychological Services;1983. 14. Kaplan E, Goodglass H, Weintraub S. Boston Naming Test. Philadelphia: Lea and Febiger; 1983. 15. Wijdicks EFM, Parisi J, Sharbrough FW. Prognostic value of myoclonic status in comatose survivors of cardiac arrest. Ann Neurol 1994;35:239-43. 16. Bruhn J, Bouillon TW, Shafer SL. Onset of propofol-induced burst suppression may be correctly detected as deepening of anaesthesia by approximate entropy but not by bispectral index. Br J Anaesth 2001;87:505-7. 17. Schneider F, Herzer W, Schroeder HW, Mueller JU, Kolyschkow P, Sommer M, et al. Effects of propofol on electrocorticography in patients with intractable partial epilepsy. J Neurosurg Anesthesiol 2011;23:150-5.